The PADI Rescue Diver course makes the serious subject of accident prevention and management enjoyable and rewarding. Becoming a PADI Rescue Diver takes your focus beyond yourself and your buddy to make diving safer for others. 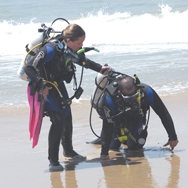 You will learn to recognize and prevent potential diving accidents and how to handle them if they do occur. Diver stress, panicked diver, and rescue diver techniques are just a few of the areas covered. The PADI Rescue Diver course consists of 12 open water training exercises and emphasizes flexibility in adapting the Rescue Diver to personal and environmental conditions. Students in past classes have rated the PADI Rescue Diver course as one of the most important and fun scuba courses they've taken. The PADI Rescue Diver certification is also a prerequisite for the PADI Divemaster course. Prerequisite: PADI Adventure Diver who has completed the Underwater Navigation Adventure Dive or have a qualifying certification from another training organization (proof of certification beyond entry-level with documentation of underwater navigation experience. ), CPR and First Aid certification (such as EFR) within the past two years (24 months), and be at least 12 yrs old. Course Fee: $269, Includes PADI Rescue Diver Manual, training fees and cert. processing. Equipment is not included, but may be rented (advanced reservations recommended). Read the PADI Rescue Diver manual and complete knowledge reviews at the end of each module. You also need to complete a PADI Student Record File (which includes a Medical Statement). If you answer yes to any of the medical history questions, we must require a signed physicians approval before you participate. You can download and review the PADI Medical Statement here. Please print a copy to take to your physician for their approval and signature if required. Dives: Sunday at Square Lake near Stillwater, Minnesota. We highly recommend the PADI Emergency Oxygen Provider course.